In winter this is a wild place, the gales from the great German Ocean flattening the hedgerows, the windows of the Bristol Arms rattling in the gusts along the empty streets, the ghosts of HMS Ganges, the Royal Navy Training College, silent now above the mudflats when the tide is out. But this was once a busy place, full of the chatter of young sailors, and during the First World War it was a famous place. Today it has lost its way: it is still one of Suffolk's biggest villages, but its remoteness ill-serves the housing estates which sprawl back towards Erwarton and Chelmondiston. Shotley is a strange place. The setting of this church is also most curious. It is further from the village it serves than any other Suffolk church. 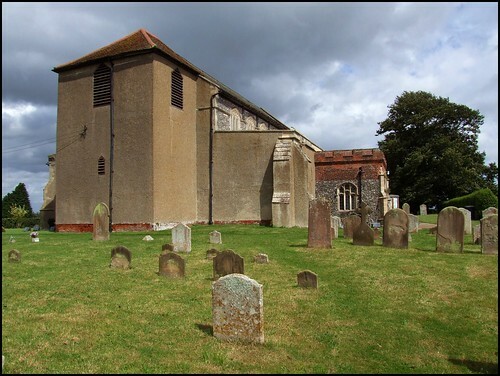 Erwarton parish church is closer to Shotley village than Shotley church is. St Mary stands in a tiny, tightly-packed hamlet in the low hills towards Chelmondiston. In fact, this was the original village. The place we now call Shotley was once an outlying fishing hamlet, Shotley Gate. You reach St Mary along one of two narrow lanes. The stubby tower of the church hugs a later raised clerestory, quite out of keeping with each other. If I come here on a hot Summer's day, and climb the steep hill leading up to it, I am always reminded more of the Dordogne than of East Anglia. The graveyard is set on a steep hillside, the huge cranes of Trimley Dock towering precipitously beyond the river below. 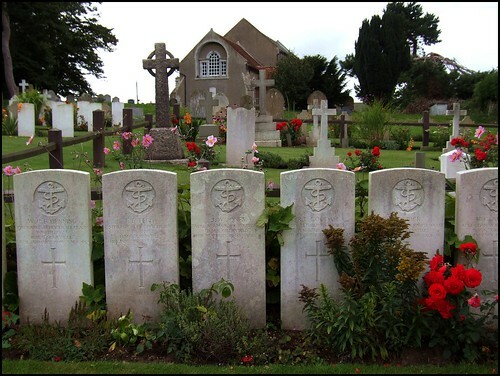 This graveyard is one of the most haunting in East Anglia, filled with the graves of mostly teenage lads sent out by HMS Ganges to die in accidents and wars. Some of their bodies were brought back for burial, but most often these are mere memorials to young boys lost deep beneath fathoms of filthy, icy water. You think of their happy laughter: climbing onto the bus to go to the pictures in Ipswich, or courting a local girl along one of the narrow, poppy-lined lanes. It is heartbreaking, particularly if you are a parent. You can see images of some of these memorials by clicking on the large photograph of Shotley church at the bottom of this page. Unusually for Suffolk, the south door opens almost onto the street. You step into the light of a wide-aisled nave. The pleasantly cool whitewashed interior seems much larger than is possible from the outside. But the eye is irresistably drawn to one of the most extraordinary chancel arches in Suffolk, a great dark wood casement surmounted by a set of arms, offset slightly in the east wall. Beyond, the effect is startling, and rather wonderful. In 1745, the year of the Jacobite Rising, the chancel here was rebuilt in the style of a Classical City of London church, a striking counterpoint to the ancient Gothic space to the west. The black and white marbled floor leads to curved, three-sided rails surrounding a sweet little holy table, the decalogue boards flanked by Moses and Aaron behind. White light pours through high windows. Such rational elegance! There could be no greater statement of the power of Protestant triumphalism at that troubled time. Stepping back westwards, the nave suddenly lifts high above the space you have just left, and is crowned above the clerestories by a gorgeous late 15th Century hammerbeam roof. The arcades stride away westwards, a simple classical casement in the tower arch reflecting back the mood of the chancel. High above are the arms of George II, contemporary with the rebuilding, and so they probably once hung above the chancel arch. And what a statement they would have made. Charles Stuart's attempted coup d'etat of 1745 was a romantic fancy, and had no real chance of succeeding, any more than his grandfather James II was ever likely to have held onto his throne more than half a century earlier. And perhaps things would not have turned out well if it had succeeded. The power of the protestant London merchant classes, which had formerly backed Cromwell, had also guaranteed the success of the Dutch William of Orange's takeover of the English throne in 1688. That power was now deeply invested in the Hanovers. The Church of England, the regular Army and the Royal Navy, those three constant and essential arms of government, reacted to the uprising by forging a consensus which would be the key to the imagination of the people, a notion of identity which would at last reinvent and create the British as a Nation. Nothing would bend it from its path now, and it would reach its apotheosis on the fields of Flanders and the Somme. But that was all in the future. Meanwhile, in the rural backwaters, the Catholic aristocracy was little shaken by the events of '45. Perhaps they stirred, and perhaps they read their newspapers with a frisson. But after all, they were only just awakening from the long years of penal silence. Although the Old Religion was still technically outlawed, they were no longer persecuted, and many had begun to retake their place in the national heirarchy. It was a compromise, but an ordered and easy one. But what of ordinary Catholics in England, Scotland and, most of all, Ireland? What of their hopes? They had been dashed along with the throne of James II at the Battle of the Boyne, and were now trampled with the troops of Charles Stuart into the blood-soaked fields of Culloden. No one had expected the Jacobites to succeed, but the fury with which the rebellion was put down had been startling. Those hopes would turn to a hurt, and it would echo uncomfortably for the emerging British State down the next two and a half centuries.